And put up a parking lot...."
Welcome and thank you for visiting this web! I’m glad you stopped by and I hope you return to visit in the weeks to come! I am profoundly grateful for having been one of eight Alcoa employees selected to participate on an Earthwatch Expedition. This web has been created for the purpose of sharing my Earthwatch Expedition experience with my colleagues and community. During my expedition to the Rainforest of Costa Rica (May 15-28) I will be uploading to this site the sounds, images and descriptions associated with my trip. Please come back often and visit the Expedition Experience link where I will post daily (as time and technology permit) journal entries, digital photographs, audio postcards and perhaps even a few video clips!! Feel free to email me at frank@myearthwatchexperience.com while I am in Costa Rica, I will reply if possible. It should be noted that the ideas and opinions contained in this web are mine (mine?! -- hmmm, I'm starting to sound like my two year old daughter) and not necessarily shared by the staff and representatives of Earthwatch or Alcoa. Once upon a time, a high school physics instructor, Thomas Cleckner, challenged us as students to come up with a completely original idea (by ‘original’ he meant one that doesn’t borrow from or depend upon existing knowledge). I have to report that 16 years later, I have yet to be inspired with a unique and truly original thought. It is in this spirit that I am offering the ideas expressed of this web. Though the ideas are not new, nor original, they are authentic as I have offered my voice to them. As an Alcoa sponsored Earthwatch Fellow, it is my obligation to promote knowledge, awareness and understanding with regard to Environmental and Sustainability issues. Sustainability, invokes a different connotative meaning among different people. 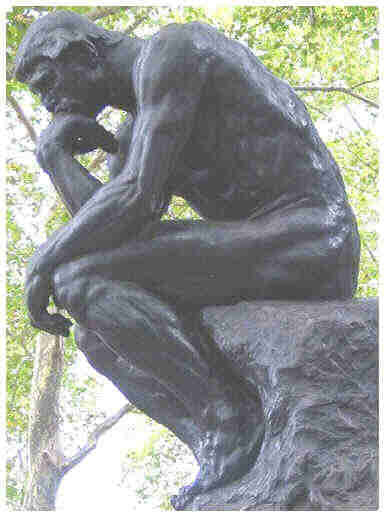 Imagine for a moment The Thinker Statue by Auguste Rodin (below is a visual cue if you aren't sure what I am referring to;). Imagine a circle of people all standing around the statue. No person, from a single vantage point can completely describe the statue. Yet if each individual were to describe, from their perspective, what they see of the statue -- a rather accurate composite description could be created. If each person were allowed to offer their own perspective a shared vision would eventually emerge…. Remove the statue from the center of the imaginary circle and replace it with "sustainability." In your mind repeat the activity and try to describe what sustainability is. The hastily assembled content of this web is an attempt to share what a sustainable vision might look like from several different perspectives on the circle. The image and vision of sustainability is not one that will be sharp and crystal clear. Rather, the image will be much like that of a mosaic. A mosaic whose image paradoxically becomes clearer the further away one is from it.